Mr. Eric Dimond from Exploratoriumin is studying a prototype of an interactive knitting machine, created by Mr. Wei Fei at the exhibition production shop at the China Science and Technology Museum. 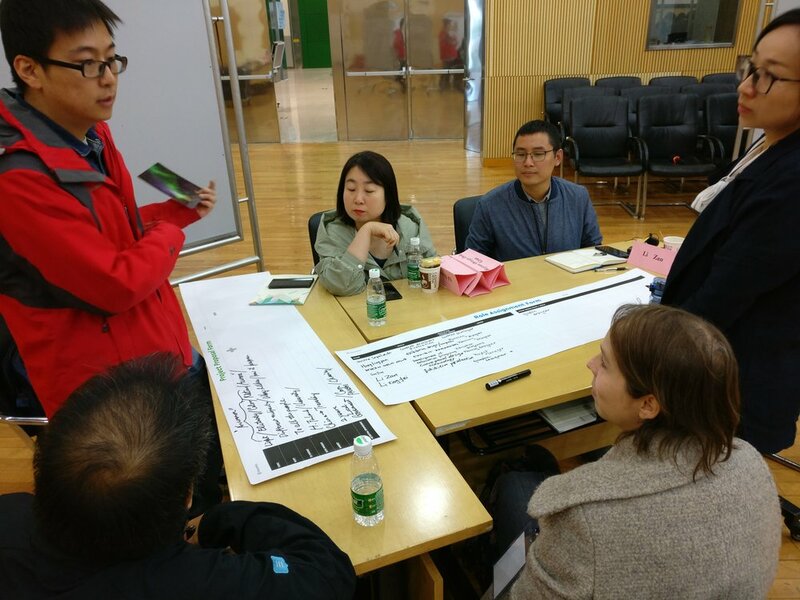 Having participated as a lecturer in the First International Training Workshop on Capacity Building for Science Centers and Museums in Beijing on October 29 th – November 4 th , I asked if the colleagues from the China Science and Technology Museum (CSTM) wanted also to tell how they experienced the workshop. After learning to know each other during the workshop, I was inspired by the idea of not only reporting myself but also letting their voice heard. Below you can read about the thoughts of the two colleagues from the CSTM exhibition department: Mr. Wei Fei and Ms. Ruiting Lee. Who are you and why did you participate this workshop? Wei Fei presenting the topic for the exhibition development task for his group. Ruiting Li setting up a prototype for an exhibit about natural catastrophies. Different materials and methods were used in prototyping. The lecturers spurred the teams by commenting and posing questions about the plans and prototypes. ﻿What was your overall experience about the workshop? Ruiting Li presenting the results of the group exercise. Me being curious about the ideas behind the exhibition design. What were the main outcomes for you? I have learnt a universal and practical process of making an entire exhibition. Those ways of brainstorm, cardboard prototypes and big planning sheets really impressed me. I was happy to make so many international friends here, so that we could share our experience and exchange our ideas about exhibition. What was different from the methods used in Chinese museums? Ruiting Li with her certificate. Do you have any suggestions for the future workshops? What does the international collaboration mean to you?